Saint Augustine of Canterbury, Bishop - My Catholic Life! Gaius Octavius Thurinus was a noble Roman. Julius Caesar became his stepfather when he adopted Octavius, posthumously, in his will. Octavius then added his dead stepfather’s name to his own, becoming Gaius Julius Caesar Octavianus. He defeated his political enemies in 31 B.C. and thus became the first Emperor of Rome. To recognize his status, the Roman Senate added another link to his long chain of names—Augustus. And it is as Augustus that he is known to history. This very Augustus called for the census forcing Mary and Joseph to transfer to Bethlehem: “In those days a decree went out from the Emperor Augustus that all the world should be registered” (Lk 2:1). Augustus reigned well and lived long, until 14 A.D. He is considered the iconic Emperor of the “Pax Romana,” a tranquil, vast, expanding, organized, rich, united, and unconquerable realm, an enormous map of which Augustus pondered from his throne in Rome. The eighth month was renamed to honor Augustus during his own lifetime. But greatness is not limited to the Roman Emperor or his Empire. The best of Rome was absorbed, filtered, purified, and reborn in the Catholic Church. As Rome declined, popes and bishops did not pickpocket the corpse of Rome or rifle through the drawers of its abandoned dressers. The transformation from Empire to Church was organic, slow, and unrelenting, like all true cultural change. It happened imperceptibly, year by year, person by person, family by family, town by town, until one day everything was different. The arc of cultural change doesn’t have a right angle. It is fitting and poetic, then, that the Church has her own great Augustus, indirectly evoking the laurel-crowned Emperor. In fact, the Church has two Augustines: Saint Augustine of Hippo, in North Africa, a Doctor of the Church; and Saint Augustine of Canterbury, today’s saint. But their marble statues are not in museums. They are in churches. Saint Augustine of Canterbury was born in an unknown year about a century after his Christian namesake’s death in 430 A.D. in North Africa. He also conquered a king, like his secular namesake, but not for his own glory. 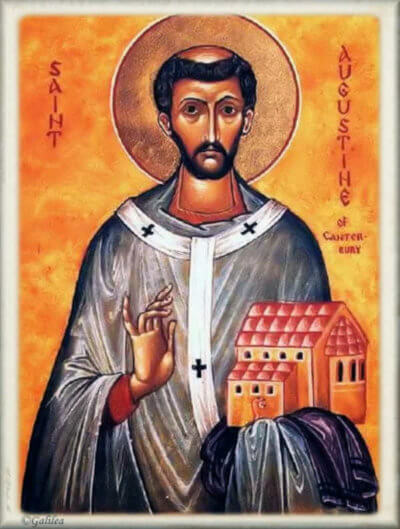 Saint Augustine of Canterbury is called the Apostle to the English (not to the British.) The history is complex. Christianity was deeply rooted in Roman Britain. British bishops attended Church Councils in France in the fourth century, and two famous Roman British Catholics well known to history lived centuries before Saint Augustine—Pelagius and Saint Patrick. But after the Romans abandoned Britain around 410 A.D., invasions of the pagan Saxons from Northern Europe mixed with native tribes to alter the cultural and religious landscape. Old Roman Britain faded as Anglo-Saxon England dawned. Christianity was relegated to the margins of the British Isles, surviving in remote regions and in an extensive network of monasteries, not parishes or dioceses, under the wise tutelage of Irish monks. This two hundred year British-Irish hibernation of Catholicism was aroused from its sleep when, in 595 A.D., Pope Saint Gregory the Great had a plan. The goal? Convert King Ethelbert. Why? Because he was an Anglo-Saxon pagan. The hope? His wife was Catholic. The means? A large missionary train. The man for the job? Saint Augustine. 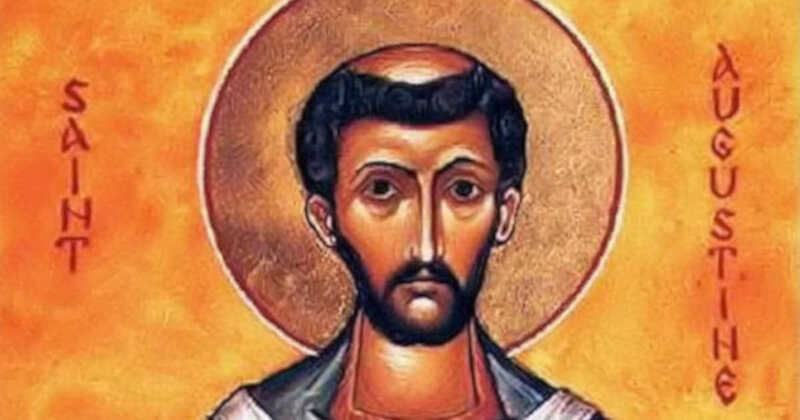 Our saint, an educated Benedictine monk from Rome, headed a large team that struggled through France on horseback, crossed the English Channel in simple boats, and finally walked to Ethelbert’s seat of power in Canterbury. The King of all Kent heard the missionaries and…converted to Catholicism! And then all his subjects converted as well in mass baptisms. The plan worked. Mission accomplished! More missionaries followed. Schools were established. Monasteries were founded. Bishops were appointed. Priests were ordained. Parishes were opened. Rough Anglo-Saxon England put on the yoke of Christ and the lovely, rolling, deep green countryside of England became Mary’s dowry. Nothing is known of the life of Saint Augustine before 595 A.D. He is famous because he was a missionary monk and later bishop. His life and his mission are indistinguishable. He accepted a dare from the Pope and did the impossible. He was himself the foundation stone upon which a Catholic nation built its house of faith for almost a millennium. Saint Augustine, your long years of prayer, asceticism, and reading as a monk prepared you for greater things. May all who seek your intercession prepare themselves in times of quiet for future challenges. May all missionaries be as daring as you in fulfilling what is asked of them.